With many exotic animal parks going under because of a lack of funding, Greater Wynnewood Exotic Animal Park in Oklahoma has taken in more residents. The park houses many different species, including a Barbary Lion. 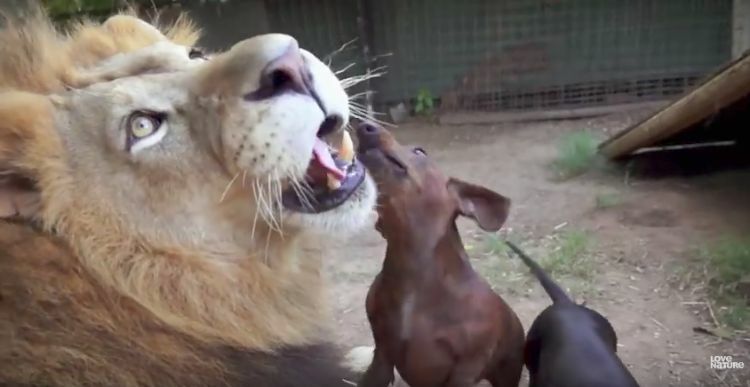 But his roomies, four little dachshunds, make for an unusual exhibit. 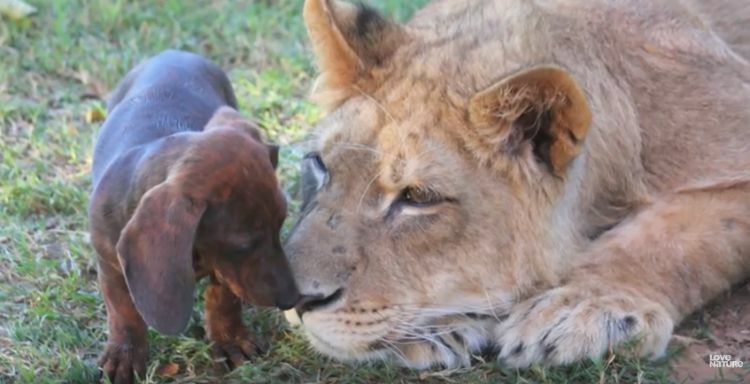 You might not think that Bonedigger, the lion, would be the best playmate for Abby and her weenie dog buddies, but you'd be totally wrong. 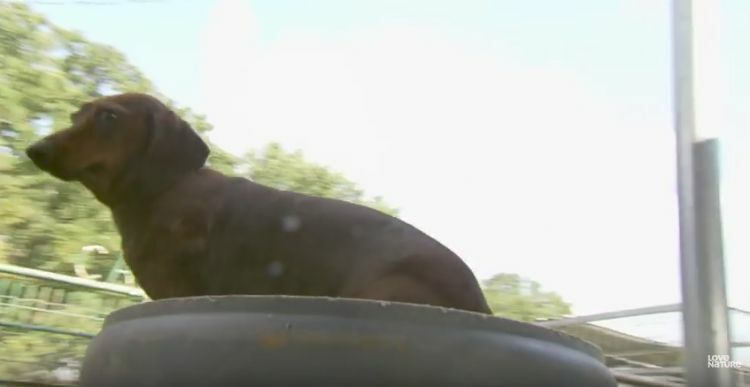 Abby is one of four dachshunds that live inside the enclosure with Bonedigger. While other animals at the part might think of them as a snack, Bonedigger's idea is completely different. 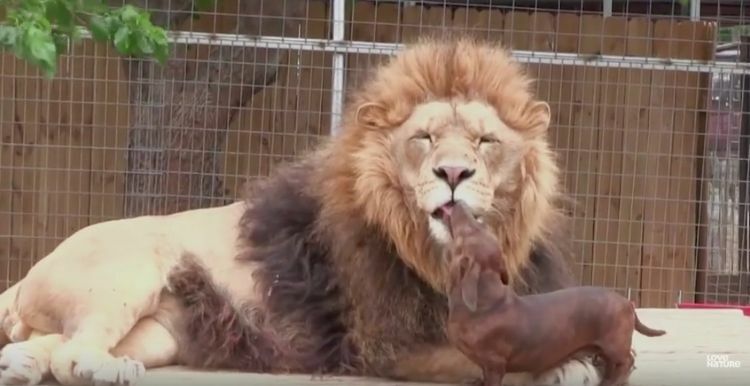 With a mouth big enough to eat all four tiny dogs in one gulp, the lion instead caresses his short-legged friends with his enormous tongue, even as they lick his face in return. Abby in particular is friendly with Bonedigger. Perhaps that is because they were introduced to each other when they were very young, only 6 or 8 weeks old. They became friends then and have remained so for many years. Abby and Bonedigger are constantly together. 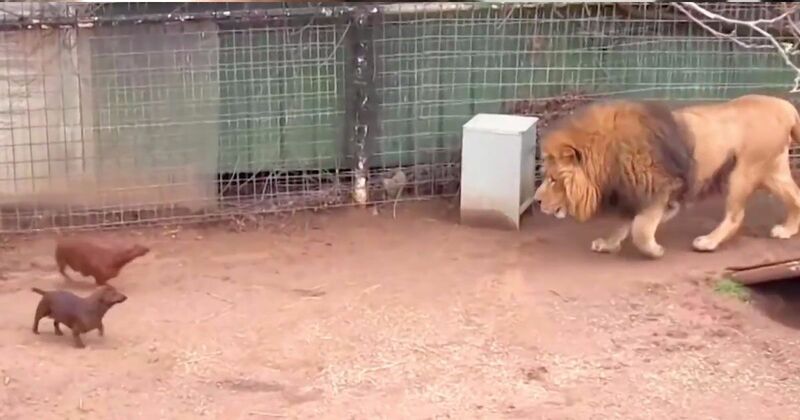 When they have to be separated for five or ten minutes while the keeper weed-eats the enclosure, the lion paces and whines about the estrangement. The dogs have to be put outside at that time, because they attack the weed-eater if they are left in the pen. 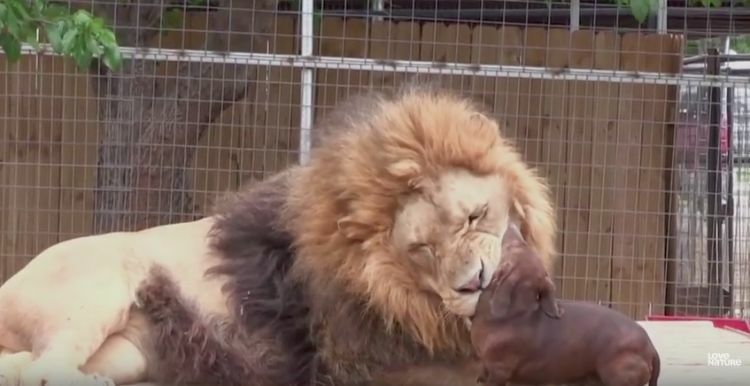 Even to the point of chewing on each other's fleas, the dogs and the lion are pleased with their relationship. Watch this video and you'll see just how much this "family" loves its members. Share it with your friends on Facebook, and I bet they'll love it as much as you do. Then tell us what you think in the comments!